Born on March 9th, 1454 in Florence, Italy, Amerigo Vespucci was a prominent Italian explorer, cartographer, merchant, navigator and financier. He is famous for coining the term the “New World.” This supercontinent was eventually named by Martin Waldseemuller “America,” which is a feminized Latin version of his Amerigo. Waldseemuller’s new world map, created in 1507, was based on Vespucci’s expeditions. It was the first map to accurately depict a separate Western Hemisphere and the Pacific Ocean as a new ocean. He remains in the history of the world as being the first cartographer to demonstrate that the New World was not the eastern outskirts of the continent Asia. The Florentine born explorer was educated by Fra Giorgio Vespucci, who was his uncle and a Dominican friar of San Marco convent in Florence. He started working as a clerk for the Medici Bank bank in Europe during the Renaissance period. In 1492, Amerigo Vespucci was sent to Cadiz, Spain as a confidential agent to observe the Medici branch office. In 1495 he worked for Giannotto Berardi who had a contract with the Crown of Castile to provide vessels for navigators travelling in the West Indies. Amerigo Vespucci further worked as a provision contractor for the expeditions in the Indies, including for the historic voyages of Christopher Columbus. Between 1497 and 1504, the famous Italian explorer made four voyages from Spain to the New World, the first alleged voyage lasted from May, 1497, until October, 1498. Europe became acquainted with the results of his groundbreaking expeditions after the publication of two letters which were both attributed to Amerigo Vespucci. While there are four voyages mentioned in the first series, only two are mentioned in the second series of letters. The second and third voyages are considered to be true by historians, as they were corroborated in his other manuscript letters. Meanwhile, the first and the forth are deemed as fabricated by Florentine publishers, by putting together various accounts. Vespucci’s second voyage, in the service of Spain, resulted in the discovery of the Amazon River, the Orinoco River and Trinidad. 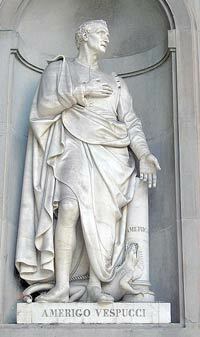 According to the letter, Vespucci, who was also a cartographer, managed to determine his longitude celestially. He did this by charting stars on the horizon. The third voyage, in the service of Portugal, was led by Portuguese explorer Goncalo Coelho between 1501 and 1502 and resulted in reaching the latitude of Patagonia, according to Vespucci s own account. He also mapped the constellation Crux as well as Alpha and Beta Centauri after this expedition. The uncertain fourth voyage is said to have taken place between 1503 and 1504. Official Portuguese documents confirm a voyage to Brazil by the same Goncalo Coelho, but do not mention Vespucci’s presence aboard. In 1508, the Italian explorer was appointed by King Ferdinand chief navigator of Spain and he was responsible with planning navigation for various voyages to the West Indies. Amerigo Vespucci passed away of an unknown cause on February 22nd, 1512 in Seville, Crown of Castile in Spain.